Finally, summer arrives - and just in time for a splendid ride on the first of August. 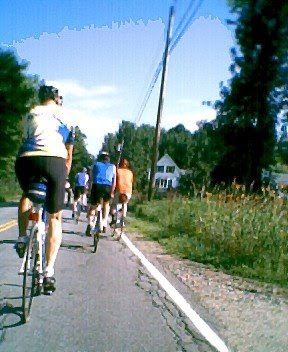 Warm, sunny, calm breezes, and a great group of ten riders - mix them all together, and the combination makes for a very nice ride from Manchester to Winthrop and Monmouth. Traffic was a bit busy on Rt.202 at the start, but soon tapered off as we turned up Rt.135 towards Maranacook Lake. We cruised down Memorial Drive along the shore and zig-zagged through Winthrop, heading south to Lake Annabessacook. The weather was so warm that we began to hear some concerns (up to now, this season unspoken) about where to find water. No problem - someone knew someone who owned a farm along the route - we'd stop there. 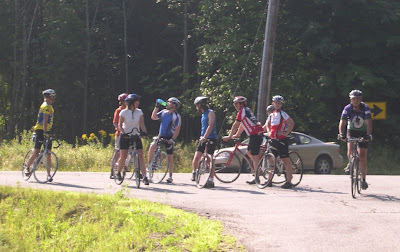 Before stopping, Denise led us along a very scenic loop in South Monmouth down some excellent back roads. 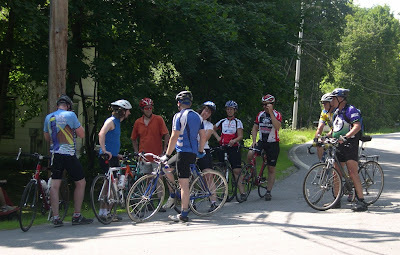 We rolled down sun-washed pavement on Tillson Road to Fish Hatchery Road, returning to Rt.135 by way of Sanborn Road. Turning onto Rt.135, we bagan to encounter a series of stiff hills as we made our way along Lake Cobbosseecontee. As we neared the end we began looking for shade when we stopped to regroup. 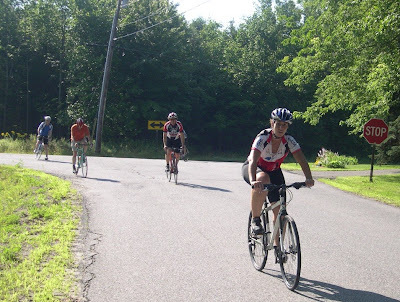 Denise took us back by way of her house where she had a large bowl of fruit salad, several coffee cakes, and other goodies prepared for a fine post-ride repast. I had every good intention of photographing the spread, but once again only remembered after the fact - I had been too absorbed in eating - the food was just too enticing. Many thanks to Denise for a fine ride, and to all for good company.